TRIVIA of Noh : Q2 : Noh and Kyogen, which is older? 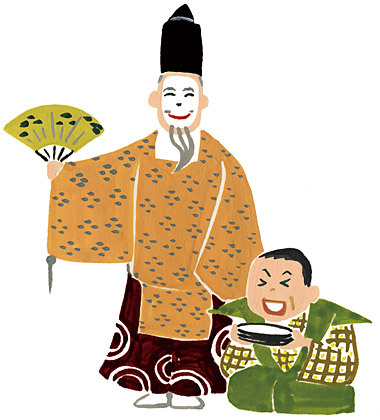 | Home | Trivia | Q2 : Noh and Kyogen, which is older? Noh and Kyogen, which is older? Although these two stage arts tend to be recognized as completely different art forms, they originally derived from the same root and are still performed on the same stage. Sarugaku, which was introduced from ancient China, generously incorporated street performances and funny mime and became a popular performance art among commoners in the early Heian era. Later, at the time of Zeami and Kannami, Noh and Kyogen started to show distinguishable characteristics: Noh dramas dramatically perform the divine and celebratory tales, love stories of the nobles, war stories, monster extermination, and tragedies involving lovers or parents and children. On the other hand, Kyogen sheds lights on commoners as the familiar main character and performs their funny stories with peculiar deeds and unique style of storytelling.